WaveSource series fiber optic light sources offer the fiber optic professional a wide range of options for their testing needs. Many different combinations are available: multimode only, singlemode only, or both multimode and singlemode. Our quad-wavelength version (WS-MDSD) has all four wavelengths (850, 1300, 1310, 1550) in one unit! Visual Fault Locators (VFL) can also be added to multimode only and singlemode only versions. VFLs can be used in both multimode and singlemode fibers. All versions of the WaveSource have two transmission modes: Continuous Wave (CW) for accurate temperature-stabilized fiber optic tests; and modulated mode. 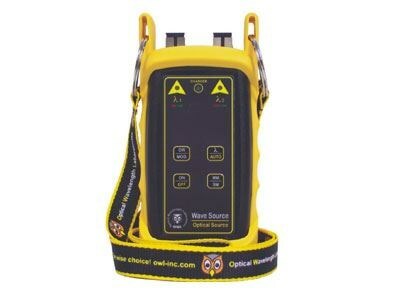 Modulated mode provides for an auto-testing function when used with the Fiber OWL 4 or WaveTester optical power meters. The modulated signal from the WaveSource tells the WaveTester to switch to the currently selected wavelength, which eliminates much of the guesswork during tests, and saves valuable time.